Ask Google the question “how did Magellan die” and based on this exact text search string, the search engine will confidently declare that the Portuguese explorer’s cause of death was a “stab wound.” I do not blame Google because this was also how I had always thought Magellan was killed; i.e. at the hands of Lapu-lapu by way of either a lance or a sword. 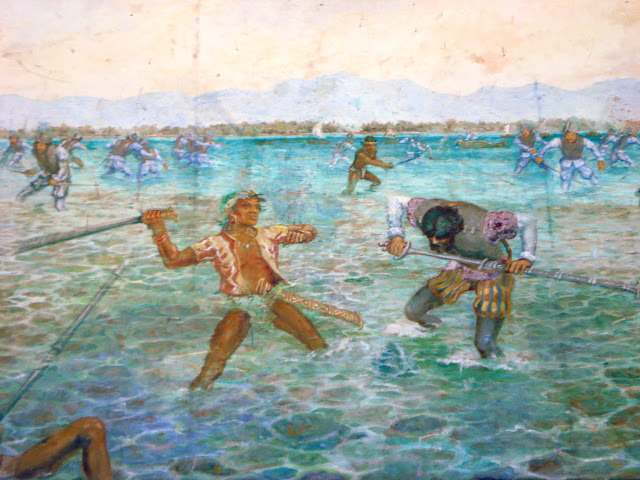 I do not recall exactly how this notion of Magellan’s death came to be etched in my mind; but my guess is that I was influenced by pictures in elementary Social Science books depicting that historic battle at Mactan, Cebu in late April of 1521. I was intrigued enough to want to know more. However, de Zuñiga’s book offered not much further in terms of information about Magellan’s death. This is hardly surprising because obviously, a Spanish writer early in the 19th century would not want to dwell on an incident when a representative of the King of Spain was killed by an Indio, i.e. a native Filipino. Go ask Google how Magellan died. The journal tells us that Magellan sailed into the port of Zubu (Cebu) on 7 April 1521 to obtain provisions. The King of Zubu had told him that he had “come at a good time,” but that it was the custom for visiting ships to pay tribute. Magellan, through an interpreter, replied that since he represented a great king (of Spain), he did not pay tribute, adding that if the king (of Zubu) wanted peace, he would have peace; and if war, then war. This must have sounded particularly ominous to the King of Zubu because the Spanish ships had fired artillery as they arrived, ostensibly as a customary greeting when arriving at a new port. The locals, including the king, were however terrified; and had to be reassured through an interpreter that the visitors had arrived just to trade. Thereafter, the King of Zubu agreed not only that Magellan did not have to pay tribute but also let the latter know that he was willing to become his friend and formalise this by way of a blood compact. Magellan agreed. Thus, peace was made between the Spaniards and Zubu. While it was the King of Zubu’s nephew who first became fascinated by the Christian religion and signified his wish to be baptised and instructed in the teachings of Christianity, before long the king himself embraced the new religion and was baptised. Likewise, 500 of his men were baptised along with him. 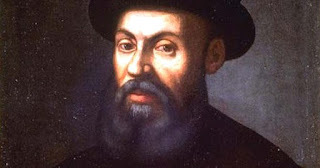 Pigafetta’s journal gave the King of Zubu’s name as “Raia Humabon.” At his baptism, Magellan gave him the name Don Carlo after the emperor of the Holy Roman Empire. Because of his conversion, the villages and hamlets (small communities) under his domain along with their petty chiefs converted and became Christians, too. That is, except the chief of a village on the nearby island of Matan (Mactan) whose name, according to Pigafetta, was Cilapulapu (Jose Rizal later conjectured that this was probably “Si Lapulapu.3”). This chieftain alone among those who were supposed to be under Raia Humabon’s jurisdiction refused to convert to Christianity or to recognise the King of Spain as his sovereign. On the 27th of April, Magellan heeded a call for help by another chieftain on Matan whose name was Zula, against his rival Cilapulapu. Magellan’s war party consisted of sixty men loaded onto three boats. His decision to engage Cilapulapu ultimately turned out to be foolhardy because, by Pigafetta’s estimate, there were 1,500 enemies waiting for them in Matan. There were rocks approaching the beach where the battle took place, so the boats could not get any closer to shore. Magellan’s war party, therefore, had to wade in water to approach. While they had muskets and crossbows with them, these turned out to be useless. There were mortars on the boat, but these were of no use, either, because the boats were too far out. Magellan was first wounded by a “poisoned arrow” shot through his leg. The Spaniards were protected by their helmets and corselets, a type of body armour; and so their enemies from Matan quickly realised that their arrows were put to better use shooting down at the legs. So no, Magellan was not killed by a stab but by many stabs from bamboo spears and probably as many hacks using their cutlasses. Before being felled, he was shot through the leg with an arrow and was injured in the arm by a spear. Although already wounded, he continued to fight on and would look back every now and again at the boats to see that his men had already boarded and could flee the battle scene back to safety. Pigafetta himself was wounded in the face by an arrow but survived to return to Spain and tell the world Magellan’s story. At no point during his narrative of the battle at Matan did he mention Magellan being felled by Cilapulapu, as I had always believed from elementary Social Science. In fact, Pigafetta made no mention of Cilapulapu at all during his narration of the battle. Of course, there were no introductory niceties between the two sides prior to battle; so Pigafetta could not have known who Cilapulapu was. At any rate, his narrative renders moot any further speculation about whether Magellan was indeed killed by Cilapulapu. The former was killed by multiple blows from men who had swarmed upon him.